Citation: NIST Multimodal Information Group. NIST 2012 Open Machine Translation (OpenMT) Evaluation LDC2013T03. Web Download. Philadelphia: Linguistic Data Consortium, 2013. NIST 2012 Open Machine Translation (OpenMT) Evaluation was developed by NIST Multimodal Information Group. 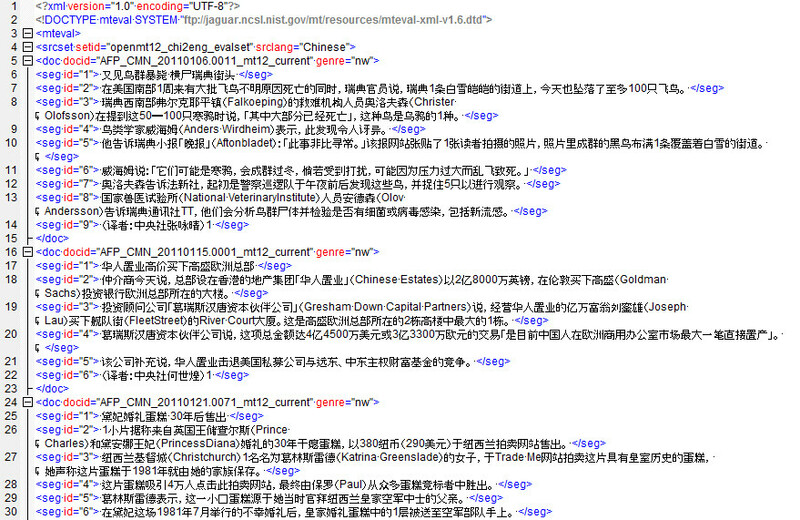 This release contains source data, reference translations and scoring software used in the NIST 2012 OpenMT evaluation, specifically, for the Chinese-to-English language pair track. The package was compiled and scoring software was developed at NIST, making use of Chinese newswire and web data and reference translations collected and developed by LDC. The objective of the OpenMT evaluation series is to support research in, and help advance the state of the art of, machine translation (MT) technologies -- technologies that translate text between human languages. Input may include all forms of text. The goal is for the output to be an adequate and fluent translation of the original. The MT evaluation series started in 2001 as part of the DARPA TIDES (Translingual Information Detection, Extraction) program. Beginning with the 2006 evaluation, the evaluations have been driven and coordinated by NIST as NIST OpenMT. These evaluations provide an important contribution to the direction of research efforts and the calibration of technical capabilities in MT. The Open MT evaluations are intended to be of interest to all researchers working on the general problem of automatic translation between human languages. To this end, they are designed to be simple, to focus on core technology issues and to be fully supported. The 2012 task was to evaluate five language pairs: Arabic-to-English, Chinese-to-English, Dari-to-English, Farsi-to-English and Korean-to-English. This release consists of the material used in the Chinese-to-English language pair track. For more general information about the NIST OpenMT evaluations, please refer to the NIST OpenMT website. This evaluation kit includes a single Perl script (mteval-v13a.pl) that may be used to produce a translation quality score for one (or more) MT systems. The script works by comparing the system output translation with a set of (expert) reference translations of the same source text. Comparison is based on finding sequences of words in the reference translations that match word sequences in the system output translation. This release contains 222 documents with corresponding source and reference files, the latter of which contains four independent human reference translations of the source data. 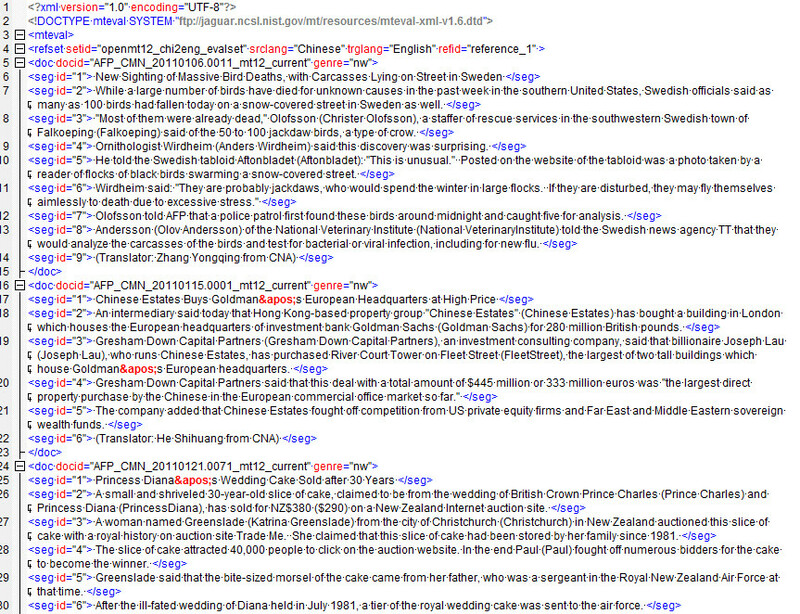 The source data is comprised of Chinese newswire and web data collected by LDC in 2011. A portion of the web data concerned the topic of food and was treated as a restricted domain. The table below displays statistics by source, genre, documents, segments and source tokens. The token counts for Chinese data are character counts, which were obtained by counting tokens matching the UNICODE-based regular expression w. The Python re module was used to obtain those counts. Please view these Chinese and English samples.